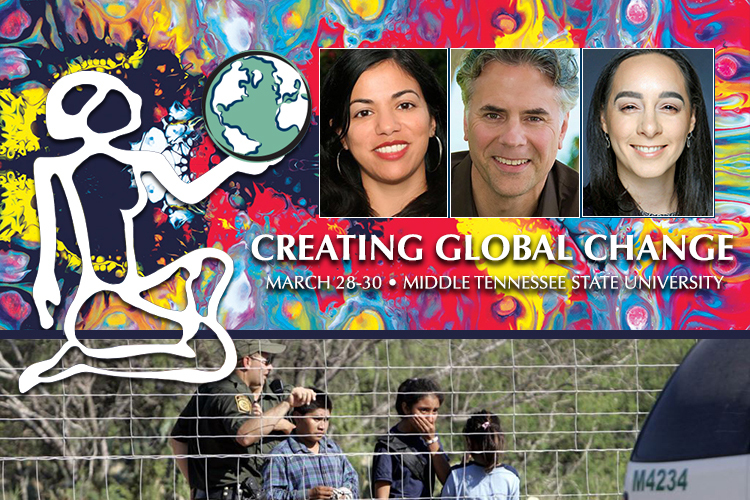 Scholars from around the world will join local feminists for a very timely conference at MTSU March 28-30. Click on the poster to see a larger PDF version. “Gendered Migrations, Bodies and Borders” is the theme of MTSU’s 13th Interdisciplinary Conference in Women’s and Gender Studies, encompassing both geographical migration and migration through gender, border crossings as well as contested bodies, identities and spaces. All the conference events are free and open to the public. Writer and journalist Daisy Hernandez will deliver the keynote address Thursday, March 28, at 4:30 p.m. in the Student Union Ballroom. She is the author of the award-winning book “A Cup of Water under My Bed: A Memoir,” her recounting of growing up queer in a Colombian-Cuban family. Hernandez also is co-editor of “Colonize This! Young Women on Today’s Feminism.” She is an assistant professor in the creative writing program at Miami University in Oxford, Ohio. Nashville in Harmony, a city chorus for people of all sexual orientations, gender identities, gender expressions and their allies, will perform beginning at 4 p.m., before Hernandez’s address. 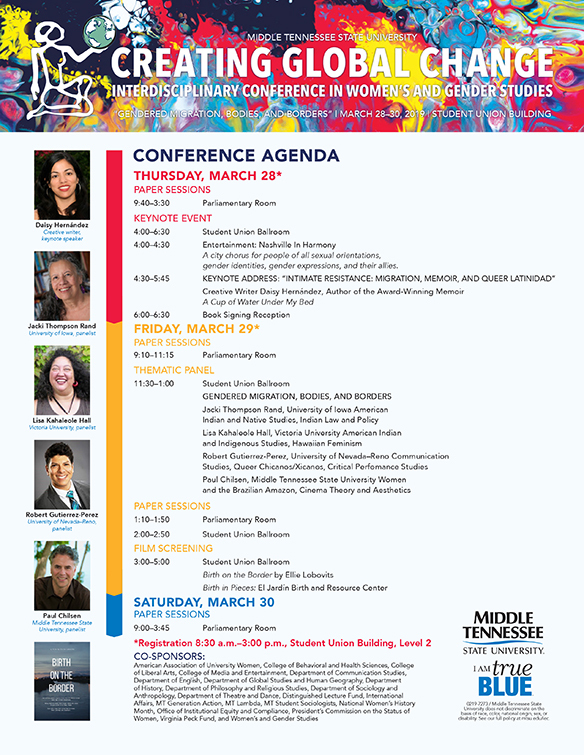 The panel discussion “Gendered Bodies and Indigenous Resistance in the Borderlands” is slated for 11:30 a.m. Friday, March 29, in the Student Union Ballroom. Experts will explore how indigenous cultures of resistance shape identity and other issues. Among the panelists will be MTSU’s Paul Chilsen, an associate professor in the Department of Media Arts, who will talk about women tribal leaders in the Brazilian Amazon. Legal border crossings for the purpose of childbirth is the topic of “Birth on the Border,” a documentary that will be screened at 3 p.m. March 29 in the Student Union Ballroom. After the film, Dr. Adelle Monteblanco, an associate professor of sociology in MTSU’s Department of Sociology and Anthropology, will guide a discussion about women giving birth and Mexican-American midwives following the film. The conference is part of the university’s celebration of National Women’s History Month and is coordinated by MTSU’s Women’s and Gender Studies Program. For more information on conference events, contact program co-chairs Roberta Chevrette, an assistant professor in the Department of Communication Studies, at roberta.chevrette@mtsu.edu, and Ashleigh McKinzie, an assistant professor of sociology, at ashleigh.mckinzie@mtsu.edu. You also can contact the Women’s and Gender Studies Program office at 615-898-5910 or womenstu@mtsu.edu. You can listen to a preview of the conference from a recent conversation with Chevrette on “MTSU On the Record” below.